Find Wadmalaw Island, SC Homes for sale. View Photos, Maps and MLS Data Now! Many New and improved items of the property. MLS#19011406. Ccbg Real Estate Group. Anchorage Plantation - As you pass through the foyer, a spacious two-story family room with custom built-ins and fireplace also opens up a large screened porch that MLS#19010971. Keller Williams Realty Charleston. Martins Point - 2BR/2BA Smart guest house (lights, entry, music, security & thermostat controlled from your smartphone. MLS#19008605. Highgate Properties. Rockland - A beautiful custom barn, built out of large cypress by Middleton Woodworks, is found on the property and includes a loft, outside kitchen and ample storage space. MLS#19009433. The Cassina Group. It's an easy drive to Camden and Aiken SC as well as Savannah and Conyers Georgia for equestrian events. MLS#19008412. Intercoast Properties, Inc..
Cherry Point - The third floor is an attic that is not finished but has high ceilings and could add an extra 350 square feet easily. MLS#19007361. Beach Residential. The main residence was recently constructed in 2012 with high-end materials and finishes, and takes advantage of the incredible views. MLS#19002782. Daniel Ravenel Sotheby'S International Realty. Whether you're looking for a tranquil retreat, an outdoor sportsman's paradise, a B & B, or an event venue, this property will not disappoint! MLS#19001856. Matt O'Neill Real Estate. Wadmalaw Island - See MLS# 18031206 GPS WILL GET YOU LOST MLS#19001554. Carolina One Real Estate. Polly Point Plantation - What if I told you that you could get all of that along with MLS#19000706. Fred Holland Realty. Longcreek Plantation - The upstairs has two generous bedrooms and two full plus one half baths, a great room, chef's MLS#18033377. Akers Ellis Real Estate Llc. Anchorage Plantation - Large master on main, 3 additional en-bath suites upstairs., library, private office, two Carriage style car garages, in ground pool, dock with boat lift. Gated Community. Amazing! MLS#18030243. Lifestyle Real Estate. Longcreek Plantation - has two bedrooms and a full bath, kitchen, fireplace, large living area and a story tale like balcony overlooking the home, land and the long creek. Under termite bond. MLS#18025076. Agentowned Charleston Group. The property is 13.02 acres in size, and subdivided into two parcels (7.5 acres for the main house and pool house, and 5.5 acres for the guest house) with the ability to build an additional dwelling on the second parcel. MLS#18021883. The Cassina Group. 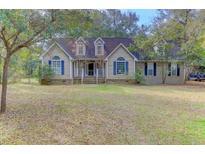 Anchorage Plantation - Quaint study and or bedroom on main level with porch access. Large rec room under hom MLS#18020962. Holcombe Fair & Lane. This is an ideal property for a private family compound! MLS#18020009. Holcombe Fair & Lane. This 4,850 SQFT custom home is as perfect for entertaining and holidays as it is for everyday enjoyment. There are countless thoughtful features MLS#18003420. William Means Real Estate, Llc. Locust Grove - In 2015 all new windows were added. MLS#17027874. Lois Lane Properties. These thoughtful features complement the surrounding landscape and natural island environment, inviting the outdoors in through the beautiful views from every room. If the MLS#17020255. William Means Real Estate, Llc. Polly Point Plantation - Adjacent to community dock for fishing crabbing,etc. MLS#17016388. Bhhs Southern Coast Real Estate. Lot 12(12 acres) is located to the right of the private road as you drive in. MLS#17014130. Carriage Properties Llc. Wadmalaw Island - Square footage does not include heated and cooled office. MLS#16026503. Daniel Ravenel Sotheby'S International Realty.